As a young girl, growing up in the 70’s, I played with Barbies – not toy cars and trucks. I coveted those Tonka trucks and Matchbox cars that belonged to the boy down the street. I reveled in the opportunity to plow around in the dirt with the two boys on my block. Until I moved to a very rural area that grows cotton, soybean, wheat and corn, I never knew how gigantic or pointy these full-size machines could be! I also never knew how delicate a mailbox was! All my mailboxes from the last four decades have held their position and shape quite easily. Just like the postal service – reliable sentinels withstanding wind, rain, hail, sleet, snow, dark of night and the occasional tornado. Unfortunately, they are not impervious to tractors big and small (or the occasional drunkard at 2 A.M.). As a quilter, I choose the sunny dining room on the front of the house for my sewing area. There is a great deal of light and warmth in the winter months plus there is a glass storm door to enjoy the scenery while I work. Normally this glass door showcases the changing of seasons and my yard’s wildlife. Even the cats welcome the open-door time to bask in the sun or watch leaves scurry about. Twice a year tractor traffic rivals the everyday rush hour on our road. Many farmers drive their large farm equipment down our road to their farm’s location to perform all sorts of functions. Most of the vehicles and their purposes are easily identifiable – some are still a mystery after 8 years of tractor-watching. Tilling, planting, fertilizing, and harvesting occur all up and down our road where farm acreage seems to outweigh the homeowner’s acreage. Simultaneously, senseless murders and mutilations of mailboxes are occurring as the tractors travel their way down the paved asphalt. So, as this is now my new “normal,” we keep a spare mailbox on hand should we be unsuccessful in reshaping the metal one that currently wobbles on its fake, wrought iron post. I think I was mad once or twice when it was annihilated, but now, it’s fodder for humorous anecdotes about living in the country. I guess if I get around to writing this book, it will have lots of pictures. My favorite, I know, will be the “before” and “after” pictures of the road clearing by the county’s snowplow from a recent January where we received 8 inches of snow. Snow in Alabama in that quantity is rare, and thankfully stops almost all traffic. Except for the snowplow, of course. 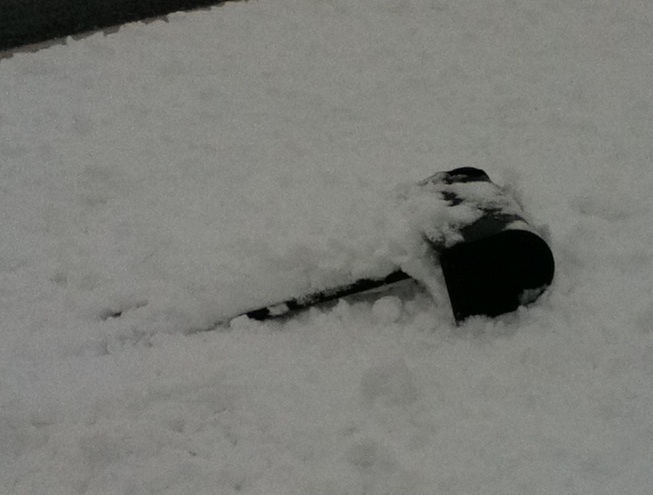 So, as luck would have it, I had just taken a picture of the snow accumulation on the black, metal mailbox because rarely would someone believe this story without digital proof. I ran into the house for a cup of hot coffee to sip and hold as the kids played in the heaps of white glory, when I noticed the snowplow had unearthed the black asphalt. It was quite an obvious occurrence when the stark black and yellow road stared back at me when just moments ago it was covered in white. What also became quite obvious, was that my mailbox was horizontal and almost 10 feet away from its fake, wrought iron post. Hysterics ensued by all four of us and I believe I spilled quite a bit of coffee from the laughter. Last week I was reflecting on the occasional messiness of my house and sometimes my life. I’m thankful to see the humor in something as silly as the constant wrecking my mailbox receives. Along with that humor has come some wisdom in what is important in my daily life. How do I see things that trouble me? I always have a choice whether I will become angry or really let go and have a good laugh – especially if my day-to-day life appears too mundane for me to fathom. I can find humor in many things, and I’m learning to apply that more readily to these haphazard, unpredictable events…which in turn allows me to concentrate on something bigger and better. Like worrying over my children’s lives, my husband’s job, maintaining the household, etc.